Despite all the hullabaloo about the US leaving the Paris Accord (and joining the new Triple Entente with Syria and Nicaragua), work to advance the (almost) worldwide climate change effort goes forward. Many of these initiatives have been covered in the media. One important step forward – with miniscule media attention – is publication of a new report on carbon pricing. The report goes on to discuss the two main policy alternatives for putting a price on carbon (a carbon tax and a cap-and-trade system) and how these alternatives might be applied in a variety of settings throughout the world. There is a good account of how the revenue raised from carbon pricing can be used to pursue an array of policy choices: cutting other taxes (the revenue-neutral option), assisting the poor and vulnerable, easing the transition for the hardest-hit economic sectors, investing in infrastructure, fostering technological change to support the transition, and – my favorite – investing in public transportation infrastructure and supportive urban planning. None of this analysis is particularly new, although it is crisply and clearly presented. The big takeaway is probably the price that the authors recommend for carbon. The bottom line recommendation is pricing of $40 to $80 per metric ton of carbon dioxide emitted by 2020 and $50 to $100 by 2030. Applying these costs through carbon taxes, cap and trade, or some combination should incentivize market forces to “decarbonize” the economy enough to keep us within the magic 2°C ceiling that scientists have established. What would those rather esoteric numbers mean in the real world? Those of us who are old transportation hands like to think in terms of cents per gallon of motor fuel. In the surface transportation sector, CBO has estimated that a tax of $20 per ton of emissions would raise the price of gasoline about 20 cents. By this measure, the $40 to $80 range of pricing recommended for 2020 would be equivalent to about 40 to 80 cents per gallon. Of course this is just a rule of thumb for one sector in one country, but I think it gives a sense of what we are talking about. Imposition of a federal gas tax (or equivalent) increase certainly isn’t politically viable at the present time in the present Congress. But it’s not crazy either. 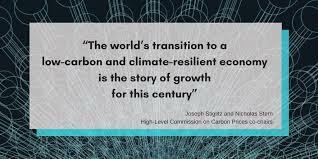 Thanks to Joe Stiglitz, Nicholas Stern, and their colleagues for giving us another step forward for Paris (and Paris is never a bad idea). I recently wrote about Poundbury (here) and garden villages (here) in Britain, but there are also good things happening in the US. Storrs Center, Connecticut is now built out! Storrs is the central place of Mansfield Township, home to the University of Connecticut………..and lots of trees. 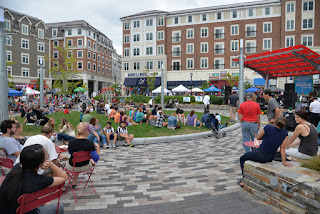 A few years back, the town leadership decided to build themselves a real town center, put together a master plan (approved 15 years ago), and then built it! Storrs Center is a mixed-use, Smart Growth development, with a real town square, lots of retail and entertainment, and housing (see their website here). The agency that implemented the plan insisted on strict sustainable, New Urbanist design standards (available here) for buildings, streets, and open spaces. The result is a handsome and virtually complete town center. The center is heavy on retail, serving as the “college town” for UConn, just across the street, as well as for the surrounding area. But there is also intensive housing, with 618 apartments (with about 1,000 tenants), 32 townhomes, and 10 condos. As I mentioned in discussing Poundbury, the transportation value of communities like this lies mostly in “being there already” – the sense that people are only a few minutes’ walk from most everything they need. For longer trips, Storrs Center has a transportation hub – the Nash-Zimmer Transportation Center – with access to buses serving the UConn campus, local communities, and intercity service to Hartford (about 40 minutes away), Providence, New York, and Boston. The Transportation Center also has parking, bike rentals, and electric vehicle chargers. Storrs Center is a real success story in community planning, a story that I for one will continue to follow with great interest. It’s always fun (for me at least) to follow British politics as well as their transportation policies (see my recent comments here and here). So how big a role does transportation play in the current UK General Election campaign? Actually, not much. Overall, the main political parties are broadly supportive of significant, and generally responsible, investment in transportation. A look at the party campaign manifestos (what we would call platforms) gives an insight into their overall approach. The Conservatives (the party in power) mainly emphasize increased investment, with promises to build a new runway at Heathrow, build the new high-speed rail line (HS2), and add lanes to congested motorways. Labour focuses its manifesto on renationalizing the railroads. In part this is a reaction to deteriorating service on the passenger network and in part a reflexive return to old Labour policies (party like it’s 1945!). The Liberal Democrats do the best at linking transportation, environment, and energy policies, with calls for a Green Transport Act. The Greens, although advocating a “People’s Transport System,” don’t offer a lot of specifics (interesting cross-national perspective: the Greens oppose the new high-speed rail line). Conservatives, Liberal Democrats, and Greens advocate increased investment in flood management infrastructure. There’s probably no immediate policy takeaway for the US from these campaign positions – the circumstances of each of these issues has very localized features – but it is clear to me that whoever wins this election will provide a more progressive transportation approach than what we are struggling with here! (An overview of all the party transportation manifestos can be found here. Those wanting to dive deeper can find the texts as follows: Conservatives here, Labour here, Liberal Democrats here, Greens here).